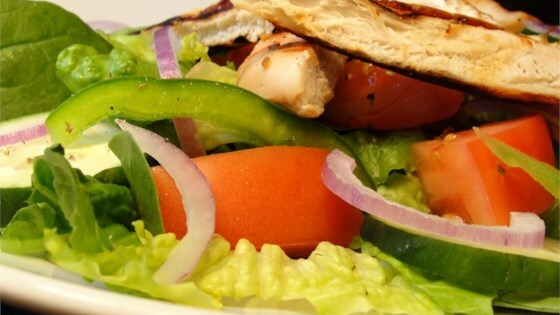 "Marinated chicken grilled then sliced and served on your favorite salad greens with a topping of parmesan cheese and croutons with creamy Caesar salad dressing. Your man will love it!" In a shallow baking pan, arrange chicken and pour mesquite-lime marinade over all. Cover and place in the refrigerator to marinate for 1/2 hour before grilling. Preheat a charcoal or gas grill to medium high heat. Grill chicken breasts for approximately 15 minutes on each side, or until meat is cooked through and is no longer pink inside. Remove from heat, cool and slice into strips. In a large bowl, toss together the lettuce, tomato, onion, pepper, cheese, croutons, dressing and chicken until evenly coated. Serve immediately. This recipe was okay but certainly nothing to write home about. It seemed to be lacking in something. I found it quite bland and would spice up the chicken if I were to make it again. If you don't have the lime marinade, try using this combination: 1/2 c red wine vinegar, 1/4 c soy (low salt), 1/2 c olive oil, 1 T parsley, 1 t basil and oregano, and 1/2 t pepper. LAWREY'S MESQUITE AND LIME MARINADE IS AVAILABLE AT MOST GROCERY STORES. THEIR TERIYAKI AND PINEAPPLE JUICE MARINADE MAKES CHICKEN LIVERS TO DIE FOR.